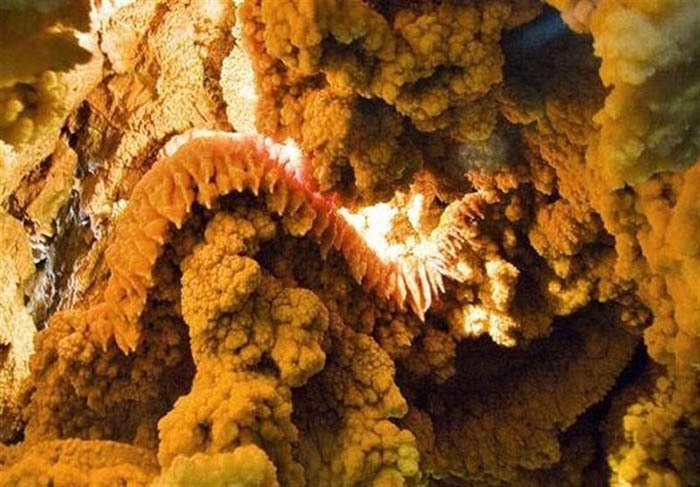 The Ali Sadr Cave originally called Ali Saad (meaning dam) or Ali Saard (meaning cold) is a cave located about 100 kilometers north of Hamedan, western Iran (more accurately at 48°18’E 35°18’N). The cave walls can extend up to 40 meters high, and it contains several large, deep lakes. The cave has a river flowing through it and most travel through the cave system is done with a boat. 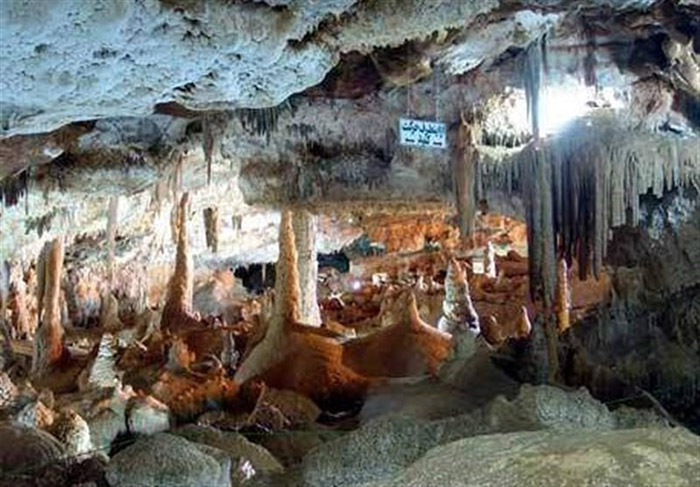 Ali Sadr cave is situated between the large cities Hamadan, Tehran, and Qom making it a popular destination for Iranians. The cave was originally discovered during the reign of Darius I (521-485 BC) which can be verified by an old inscription at the entrance of the tunnel. However, the knowledge of the existence of the tunnel was lost, and only rediscovered in 1978 when a local shepherd followed the tunnel searching for water or a lost goat. 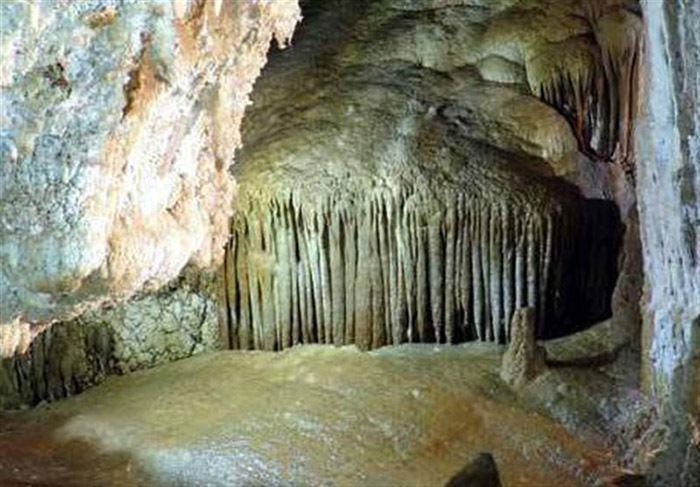 This cave is located at 48°18’E 35°18’N, in the southern part of Ali Sadr village. The cave digs into a hill called Sari Ghiyeh which also includes two other caves called Sarab and Soubashi, each 7 and 11 kilometers away from Ali Sadr Cave. Apparently the water in Ali Sadr cave is supplied by a spring in Sarab. In the summer of 2001, a German/British expedition surveyed the cave to be 11 kilometers long. The main chamber of the cave is 100 meters by 50 meters and 40 meters high. The natural entrance to Ali Sadr cave (sinkhole) has been made accessible by stairs. It is gated and roofed. The stairs lead down to a concrete walkway in a dry gallery of approximately 3-4 m of height and 6-8 m width. The surface water enters the sinkhole during the wet months of the year, follows the walkway and disappears to the left where the first lake can be found. The dry entrance section of the cave connects through joint-controlled maze of smaller passages to the artificial (main) entrance to Ali Sadr cave. These passages are water-filled in their southern extensions. The artificial (Main) entrance begins as a 20 m long tunnel that slopes gently downhill to a wide gallery of 15 by 6 m formed under phreatic conditions. A calcite/aragonite ledge at the left wall marks a former water level and has some fine stalactites and crystals. To the right of the artificial entrance there is a Tearoom/Cafe for visitors which is operational in the summer. 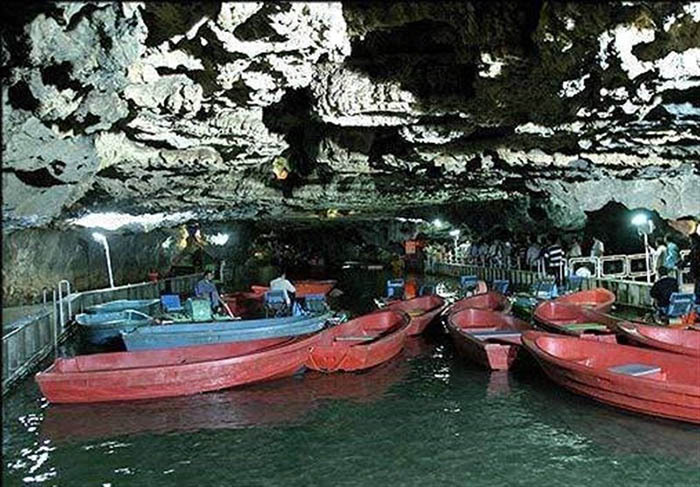 The walkways coming from both entrances join at the beginning of the water-filled passages of Ali Sadr cave where the main jetty from which the boats that take tourist through the cave are boarded. Tourists are guided into plastic boats at this point and these are pulled through the cave by paddling boats (Pedlo’s) paddled and steered by the guides. The underground boat trip follows the main gallery to the SW that is up to 25 m wide and 4 m high (above water level), passing some maintenance facilities (cabins, boat depots, water-level indicator etc.). After nearly 200 m the gallery turns to the left (SE) and diminishes temporarily in size. The dip of the layers can be clearly observed in this part of the cave. Some small water-filled galleries branches off to the left to meet the “”six-entrances room”” which is part of the return journey of the tourist trip. After approximately 100 m the main route opens up into a wide lake passage once again. This runs straight in a SE direction for the next 300 m. There are four large passages leading to the NE towards the central north-south-axis of the cave (see below) some of which are galleries up to 40 m wide and 30 m high. In the middle of the 300 m long section leading to the SE, where the passage reduces in size for some meters and the depth of the water decreases to less than 1 m, a sizeable dinosaur sculpture has been installed for the enjoyment of amusement of children. 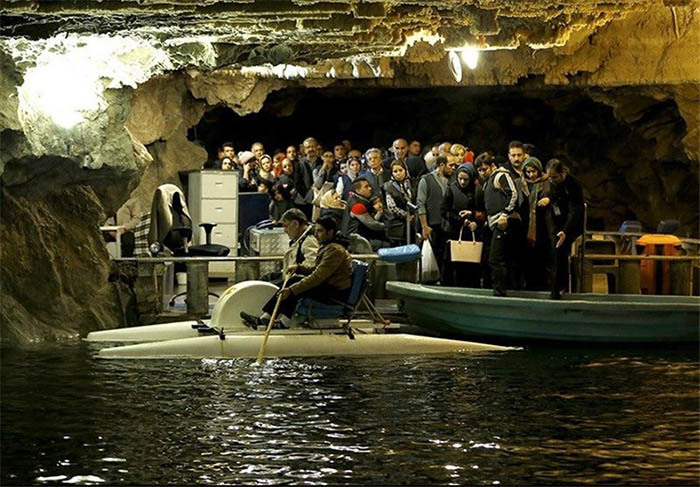 Having reached the end of this section the gallery turns to the NE and one reaches a pontoon where the tourists leave the boats to climb into the largest chamber of Ali Sadr cave, called “Freedom Hall””. From the place where the tourists initially boards the boats to this pontoon the entire roof of the cave is covered by calcitic/aragonitic ledges that are full of crystals and small stalactites, marking former water levels. 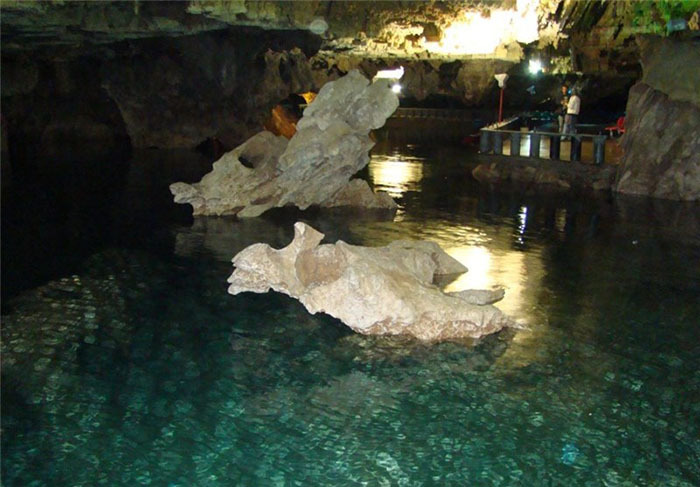 This unique 600 m long structure is one of the most remarkable features of Ali Sadr cave and together with the dark green of the lakes, that in places are up to 15 m deep and the white/yellow crystals give the dark rock inside the cave a superb appearance. Just before the point where tourist trail climbs from the pontoon into the “”Freedom Hall”” the ceiling is covered with a fantastic display of up to 9 ledges one upon the other. The mineralization is predominantly aragonitic which indicates a relatively warm environment for the deposition of the crystals. Freedom Hall was created by breakdown along tectonic fault zones and the visitor has to ascend about 30m up a boulder pile via a succession of fine marble stairs. At the highest point of the boulder pile the climb ends in a circular marble platform overlooking an impressive chamber that at its longest axis is 100m wide. Freedom Hall is exited via another succession of fine marble stairs that leave the center of the chamber in SE direction. Before the walkway reaches another pontoon to cross a 40m long lake extremely fine calcite wall coverings can be found. At this point a series of wet galleries lead to the E where they end in breakdown. Back in the main passage, at the end of the pontoons a dry walkable gallery of more than 100m in length leads to the SE. This passage has a very nice phreatic cross-section. At the end of this gallery the tourist trail turns to the right where the permanently water-filled passages of Ali Sadr cave are reached once again. Here the roof of the passage is covered with helicities. To the left (SE) the new sections of the cave, which are not open to tourists, branch off. The tourists board the boats again to start the journey back through the cave passing the aforementioned pontoon where they alighted from the boats earlier in the trip and from there back towards the cave’s entrances. To the W extensive labyrinthine water-filled passages of smaller dimensions can be found. However, before the dinosaur is reached again, the guided tour leaves the known gallery to enter a very large passage that makes up the main north-south-axis in the central section of Ali Sadr cave. This joint controlled axis is partly enlarged to a succession of impressive chambers. After about 100 m a gate closes a water-filled branch to the right (East). The gated passage gives access to a network of waterways leading to the “”wedding room”” (also called “”1.000 stalactites room””). This room is paved with marble slabs. The Wedding Room as it is known has been used for special events in the past and is still today accessible for tourists that are willing to pay an extra fee. The “”wedding room”” is actually not a wide chamber but a passage that forms a loop decorated with many wonderful small white stalactites, draperies and helicities. The southern part of the “”wedding room”” has connection to the aforementioned (“”Freedom Hall””) main chamber of Ghar Ali. Having reached the end of the spacious central north-south-passage after 220 m the tourist boat tour turns to the left (West) towards the “”six-entrances room””. This room is a crossing of several passages in a small maze of rifts. 150 m later the underground boat trip reaches the starting jetty again where the tourists leave the boats to exit the cave. The usual tourist visit uses the artificial tunnel entrances to the cave exclusively. Visitors undertaking the ‘regular’ tour are guided a distance of about 2.100 m through the cave, 1.470 m of which is by boat. The ‘extended’ tour (“”wedding room””) involves an underground boat course of 2.010 m: the longest underground boat trip world-wide. The new parts in the south of Ali Sadr cave are not accessible for tourists. These passages were surveyed by the 2000/2001 project and only minor open leads were left. The predominantly dry galleries are much smaller than the ones in the tourist section. A narrow and difficult to find passage contains remarkably fine dripstones and helicities. In other places large aragonite crystals are abundant. The southern dry section of Ali Sadr cave is extensive and very labyrinthine as small passages follow wide galleries.